The following is a real miracle photo story that actually happened to me. In late March, 2005, I had taken some photographs of the Mount Zion hill and the ben Hinnom Valley area in Jerusalem, from across the way, just outside our new Worship Watch position, Succat Hallel, located next to the Mount Zion Hotel in Jerusalem. On the evening of April 7th, 2005, I was at home scanning these film negatives when one photo suddenly came up golden on my desktop computer screen from one of the negative strips. A few minutes later another photo also came up golden on my screen. When I went to& repeat this process, doing the same process over a second time, the photo now came out totally normal on my computer screen, i.e... a normal hill, a cloudy sky, now nothing special or unusual, and just like all the rest of the other photos had previously come out. Where I took these photos, just outside the Worship Watch position, is about the same location, where in early June, 1999, God showed me two quick visions of this same area, showing the Mount Zion hills and the ben Hinnom Valley full of people with their hands raised up, as the Great Outpouring of God's Spirit was falling on them. God showed me this first vision from 50 feet high in mid air, just to the left of the Mount Zion hotel. Doing nature photograpy with bible scripture was my profession in the United States since 1982. However, scanning photo negatives is something that was new for me at the time. I did nothing that would change these two photos that came up as golden photos of Mount Zion hill, except for some weeks later when I added the appropriate bible scriptures from the Tanakh (Old Testament) to both these of photos, as I felt directed by God. I called David Bahar, the technician for my scanner machine who works in Tel Aviv, hoping that he would easily explain how these golden photos had happened. But David, a technician who has 20 years experience in the photo optics field, told me that he had never seen anything like this. What was amazing that David told me is that one of the three primary colors, which is absolutely necessary for every picture, is missing in both of these two golden photos. And for this to happen is impossible, which cannot be explained. This is one of many reasons why these two photos are really a miracle. We're also talking about a picture of multi 1,000's of different mini colored dots of Mount Zion hill, suddenly turning into a picture of just basically two different colors: the stones turning gold, and all the trees turning golden brown, with a white sky, where the sky had been overcast and cloudy in all these normal photo negatives. Also, the bottom of the golden photo was cut off at an exact position, so as not to show the road below with the auto traffic, and the top area of the photo has been raised giving much more sky. This same miracle happened two times on two different normal negative strips of four negatives, while scanning dozens of photos. The 2nd photo shows the famous Cable Car, and the 200 meter life line across to the Mount Zion hill, which also came out golden. This Cable Car was used as a real life line in the 1948 war, for getting food and medical supplies over to the Jewish Israelis holding out for survival from the Arabs on Mount Zion hill, who were then cut-off and in great need of help. The Cable Car went out from a large window in the Saint John Hospital, which today is part of Mount Zion Hotel. Notice on the photo that the 200 meter wire from the Cable Car across to the Mount Zion hill has also turned golden! God made these two normal photos appear Golden on my computer screen from my scanner in only an instant! My wife and I were both sitting there at the time when this happened. The film negatives are normal. "By the mouth of two or three witnesses, a thing shall be established." 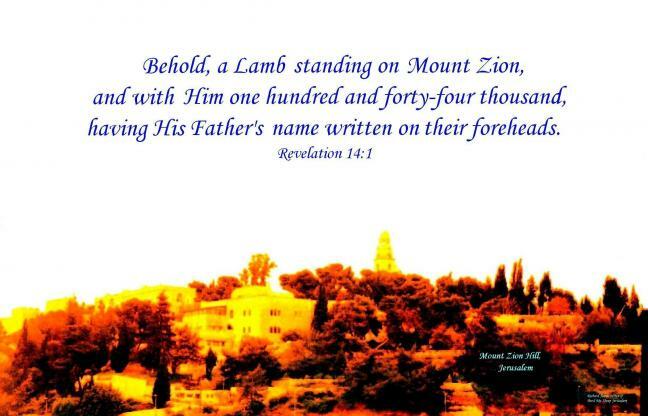 [Deuteronomy 19:15] In this case the two witnesses are these two golden photos of Mount Zion hill. Each photo confirms the information shown in the other photo, and also both photos indicate that this Golden Glory is somehow originating from the Cable Car area... i.e. the Worship Watch position located just to the left on the Cable Car by the Mount Zion Hotel. On Sunday, May 22nd, 2005, I went to Tel Aviv to see David Bahar at the scanner company. He tested my scanner machine and told me that it worked perfectly. He and another technician then tested the two golden photos, and both were amazed at what they discovered next. All pictures in our world of color spectrum are made up of three primary colors, red, green, and blue (RGB). They discovered that there is no blue found in either of these two Golden photos! How can that be? They don't know! David also discovered other unique findings written up in his two lab reports. I know God did this, and that these are really two Miracle photos; that this is truly ‘a Prophetic Sign' from God for all of us, concerning the Glorious future that God will be bringing to Zion and to Jerusalem sometime very soon, over the Mount Zion hills and the ben Hinnom Valley. I also believe that God did this to encourage all the believers who serve God as part of this new 24/7 Worship Watch position in Jerusalem. For more information about this Worship Watch, please go to www.JerusalemPraise.com.